As always, Nintendo is full of surprises. Following the company's E3 Nintendo Direct broadcast, it uploaded a new trailer for the highly anticipated sequel to The Legend of Zelda: A Link to the Past. 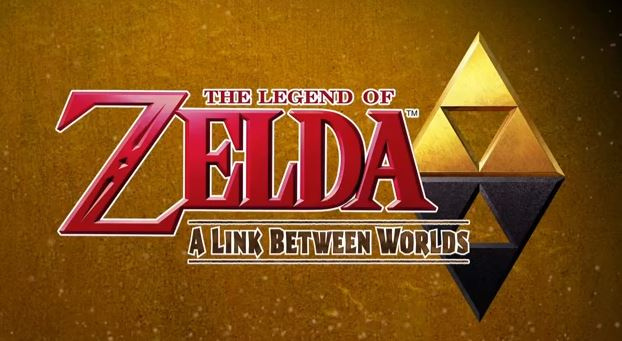 What's most interesting about this trailer, is that it confirms the name to the upcoming game, so we no longer have to call it A Link to the Past 2; it goes by the official name of The Legend of Zelda: A Link Between Worlds. Check out the trailer below for more footage on the game. A release date has yet to be announced, but it's safe to say it's already high on our wish-list. As always, let us know your thoughts in the comment section. Sounds fine. When can we play it? I'd much rather have a trailer for Zelda WiiU. :/ Still, I'm looking forward to this. They kept the pun! Awesome. I really love that logo with the Triforce. Can't wait to play the game! i wish that worm boss isnt in the final game. it's a good boss, but i want original bosses, not what i've already fought before! also i like the new stamina/magic bar design. If they released this for WiiU, I would buy a WiiU. Seriously, screw the Wind Waker rehash, PORT THIS INSTEAD! I don't know much about the original or this sequel, but I had to come give kudos to Nintendo for the title, I was half expecting LoZ: A Link to the Past 3DS. "A Link Between Worlds" really gives it that adventure feel. This, and Smash, are by far the only big hits on my radar. Here's to hoping that TLoZ: ALbW is as creative as the original that inspired it! I'm a bit on the fence for this one.... I wasn't a big fan of the original ALttP, and this looks VERY similar... however, this does look pretty good. I'm just worried I'll be sick of 2D Zelda by the time this comes out, with the Oracle games and my planned replay of Link's Awakening. I'd much prefer a full, 3D Zelda on 3DS, but I'll just hope that something like that comes down the line later on in the 3DS's life cycle. @EpicNavi Why would they have a trailer ready when they've made it obviously that it's still quite a ways off? :/ It's why we have Wind Waker HD, haha. That title and logo is flippin' sweet, though! @LtAldoRaine That's exactly what I thought. The trailer is amazing! I know where $40 of my money will be going this winter. I'm assuming its a link between hyrule and the dark world (by the triforce logo). I want dark world footage. Well I am glad the name is similar to a link to the past. The name is good and I like it. Looks great. I am a little worried about the screen being "zoomed in" a bit too much but this trailer looks better than the others that I have seen. It's a sequel to my favorite game. I'll get it Day 1. The title actually doesn't do much for me, but I'll get over it. It would be neat if they released some dlc for the game like some old 2d zeldas remade, but then again we got vc so I guess not. The name lacks a certain flow to it. "a Link between Worlds" sound very dry and cuts too early. Maybe something like "A Link Between New Worlds" or "A Link Between Two Worlds" would sound better? I have missed a top-down Zelda game, been years since one came out. The name is so-so. I like it that it immediately harkens back to ALttP, but it just doesn't roll off the tonge as smoothly. That said, I obviously couldn't be more excited for this. @One-Winged-Pit hourglass and spirit tracks? A Link to the Past was too easy, I hope it's much harder. @SirQuincealot Not really the same though. This Link is probably the most heroic Link ever to date. Hes been through 5 adventures and beaten not taken a proper break. Now that is a terrible name. Just doesn't fit right off the tongue. I'm sure it'll grow on my eventually. So, it's Zelda: ALBW then? Hmm... Maybe the Triforce created some kind of a ripple effect at the end of ALttP affecting the golden realm in an unexpected way? A Link to the Past, Oracles of Ages and Seasons, Link's Awakening and now this! Wonder if this game takes place after Link's Awakening or before the Oracles? I love that Nintendo hasn't abandoned the top-down approach to Zelda games. This is going to be awesome. GamerZack7: OW! My mouth! But what an impressive game! It even has the sound effects from the previous title! But what happened to Link's purple dye-job?! Looks like Nintendo ran out of ideas. This is simply a new rendition of that same world you were exploring in ALttP. Nintendo has lost their touch. I have to be honest with that statement. I find myself being more excited that I thought I would be for this. @LordGeovanni: Link has purple hair in A Link to the Past. @LordGeovanni: It appears that Hylians have a wider gamut of hair colours than normal humans!